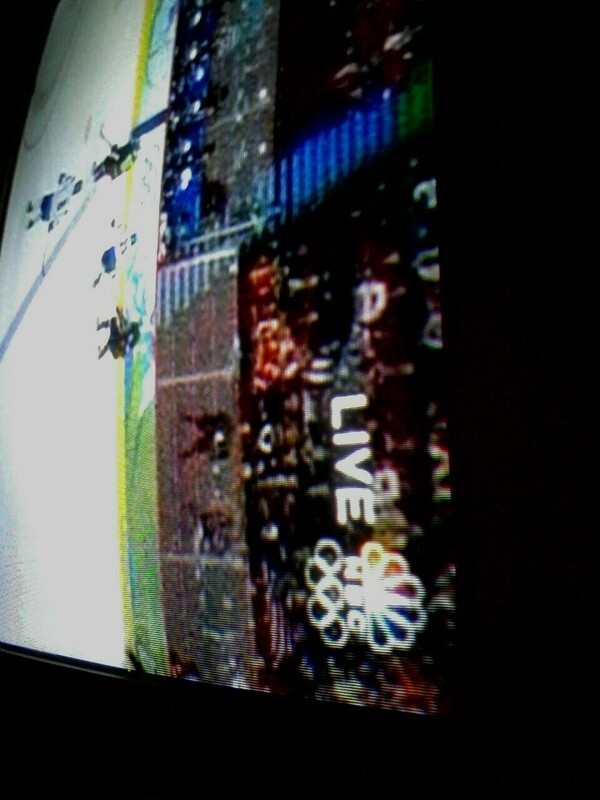 “Live – NBC” Something West Coast viewers saw only briefly during the 2010 Vancouver Winter Games. For this year’s London games, seeing such a thing may almost be a mirage. During the Calgary Winter Games in 1988, I remember the announcer for ABC (I want to say Jim McKay) explaining to the audience watching at home how, even though the event was live, there could be brief seconds of delay as the feed is uplinked from Canada and downlinked from orbiting satellites to local stations. I believe the point was that ABC was making was that the coverage was as live as technically possible. Contrast that with NBC’s coverage of the London Summer Games, where they’re largely sticking with their “If you haven’t seen it, it’s new to you!” mantra. That motto didn’t work for summer reruns in 1997 and it doesn’t work for covering an immense, live sporting event in an age of Facebook and Twitter. With the London Games fully underway, an old sport of sorts has taken off online — complaining about NBC’s ever-lackluster presentation of the Olympics. As this Associated Press article indicates, critics and supporters alike will point out that this isn’t a new event, but the increasing use of social networking has bolstered criticisms and underscored NBC’s relatively poor broadcasting choices. Social networking spoils NBC’s tape-delay plans because people around the world are sharing results as they happen. Unless people go out of their way to avoid the results, the results of key competitions are known hours before NBC gets around to broadcasting them over the air. This was an issue during the Vancouver 2010 Games, but it seems like a much bigger issue today. I’ve never been shy to criticize NBC’s broadcasting choices, especially those that force West Coast viewers to suffer tape delays for events happening in their time zone (like during Vancouver). In the past, the complaints just seemed to peter out after a while. Not so in London, where comments are shared and added to like flames of a fire. Thus far, people watching the London Games have taken to using the #nbcfail tag on Twitter to help express their disdain of the coverage. The complaints have been wide-ranging, but have thus far focused on the delayed Opening Ceremonies on Friday and a 7- to 11-hour delay for Saturday’s 400 IM men’s swimming final featuring Ryan Lochte and Michael Phelps. Sunday’s gripes seem to be less focused, with people carping about a bevy of events delayed into primetime and some tweeting about the reaction to #nbcfail. There’s also a Internet meme where people are jokingly tweeting about NBC’s tape-delayed coverage of historical events. So what’s the solution? I think the Canadian model works well for a sports fan and a viewer — live coverage whenever possible and highlights when necessary. I’m not sure what current rightsholder CTV is doing, but the Canadian Broadcasting Corporation would only air highlight packages during times when live coverage wasn’t feasible … but after airing the live coverage. Looking at NBC’s position, they did fork out the dough to air the Games, so they’re obviously in the driver’s seat about their decisions. Their arguments include the fact that they can reach a greater audience and earn more ad dollars by airing taped events in primetime. That seems to be borne out by the record ratings for the first two days of the London Games. They’ve also made fun of the Canadian model. I remember during the Athens Games in 2004 reading about an NBC producer touting the higher American ratings than their Canadian counterparts. NBC has also countered critics by saying all the events are streaming live online. I appreciate that effort — although I question how much of an effort it really is, considering that Olympic Broadcasting Services provides feeds of every event anyway. Still, it’s a step up from the Vancouver Games, where most events were kept offline until they aired on the Peacock. The service was fairly comprehensive during the Beijing Games, but I’m shut out this time — people need to prove they’re paying for an expanded cable or satellite subscription before they can get access. People with rabbit ears on their televisions are shut out. One final point about NBC that people rarely seem to consider is the fact that NBC isn’t a monolithic network — they have to keep their local affiliates happy. I have no doubt that local stations’ desires to garner the largest audiences is also a factor in NBC’s scheduling. That’s also why I believe local news and key syndicated shows are still shown, despite the huge amount of Olympics events available. It’s hard to say what the ultimate impact of #NBCfail will be. For now, the ratings tend to support NBC’s decisions regarding the tape-delayed experience they offer television viewers. However, perhaps #NBCfail will continue to point out that this should be a golden era of sports broadcasting and that a significant number of people are aware of better, live offerings than what NBC is serving up. Opening Ceremonies concerns: While I’m still making my way through an over-stuffed Opening Ceremonies, I have to ding NBC Olympics for its decision to air ads instead of showing the Olympic Oaths (prior to the caldron lighting). Amid all of the symbolism of the Opening Ceremonies, having athletes, coaches and officials swear to the true spirit of sportsmanship is a huge one. The Age of Australia identified the oath takers as UK taewondo athlete Sarah Stevenson, boxing referee Mik Basi for officials and canoeing coach Eric Farrell. Also, according to the International Olympic Committee’s guide to Opening Ceremonies (PDF), every ceremony is to include 11 elements. The oaths are three of the elements. NBC should have made time for at least the athletes’ oath. The network was also criticized for airing a pretaped interview instead of showing a portion of the ceremonies commemorating victims of terrorism (particularly the July 7, 2005, attacks in London). Clapper” and the clap, neither is a welcome holiday gift. It started with that one and I was inspired to keep going. I’m dishing these tips every day on my Twitter account, but you can also view all of them on this page. I hope to have a tip every day up until Christmas, but coming up with them can be tough (especially if I was trying to be funny). If you have any ideas, please share them in the comments. Less than a day after the microblogging Web site Twitter was briefly knocked offline and social Web site Facebook was hampered, a picture of what happened began to develop and who was targeted. Instead of some sort of corporate or international intrigue, it appeared like the attacks were a massively misguided effort to silence one individual. It was pretty clear that Twitter, Facebook and others were hampered because of a Denial of Service attack — where a Web site is hit with so many requests or Web traffic that it buckles under the pressure. According to BBC News, the target was believed to be one blogger, named Georgy, who has criticized Russia’s role in last year’s war against the country of Georgia, the BBC reported. Facebook officials said the attack was directed at the blogger’s page, but it impacted the rest of the service as well. Talk about overkill. In this effort to target one individual, the people responsible attacked several networks affecting hundreds of millions of people. It would be like nuking a large city in an effort to kill one man, or burning the haystack to get at that needle. If the intent was to silence one person’s opinion — it will probably backfire. More people will now probably be more interested in what this one person has to say because of this effort. Additionally, cyberterrorism is not likely to engender the hackers to the general public. Personally speaking, I feel a little bit of animus toward whoever would be willing to launch such a foolhardy and unsophisticated attack. While the target was apparently Georgy, also known as Cyxymu, it’s not known who launched the attack. The blogger apparently blames Russia although some experts said there is no evidence that this is the case. I definitely hope that we find the parties responsible. It’s also a reminder to Web sites that they need to develop more defenses against these types of attacks.